A French door is a stylish home fixture that features multiple small windows also called "Lights" in its inherent design. These are also called as French windows. French doors are not ideal when you are looking for privacy but are popular for their aesthesis while also encouraging plenty of sunlight into the house. A divided lite French door what a traditional French door, that is assembled with multiple pieces of glass. They also have decorative structures also called mullions that are used as dividers for adjacent window panes. 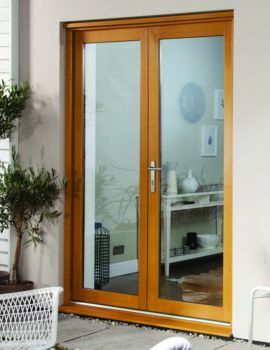 Traditionally French doors were made from hardwood. Exterior French doors are not the same as traditional French doors as these are made of double-pane glass for improved insulation. These doors also come with a decorative grille embedded between the panes, and some come with grilles superimposed over of a pane of glass. 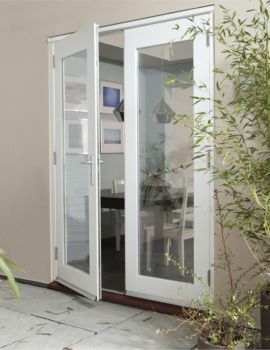 There are many reasons why French doors are included in a home design and also recommended by architects. These can also be used as patio doors, and become a part of a beautiful exterior decoration of the home like a landscaped lawn. Internally, these give a cheery, breezy look while bringing in plenty of natural light. In some cases, French doors can bolted and used as an interior wall. Although they are more expensive than standard doors and do not provide sufficient protection in hurricanes and strong winds, these are quite popular. 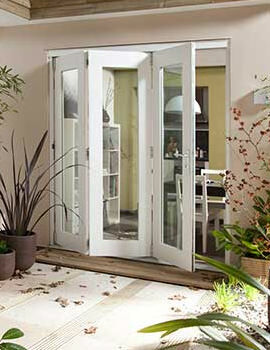 Find a refreshing range of quality French Doors at Buildworld. Choose from a variety of doors including Oak and White Wooden doors as well as clean and manageable PVCu doors. We also have a variety of sizes also available to your fit needs. Materials used range from Oak to UPVC. 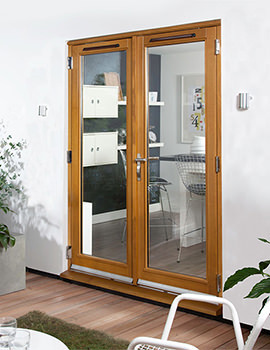 Wood provides a traditional look to your French doors like no other. Wood doors are expensive and less energy efficient. Being a natural material, it also needs constant maintenance and can also fade with light exposure. It’s the material of choice in construction and rightly so. Its best property is that it can be moulded to look like wood or any other material and at a fraction of the cost. Very energy efficient and resistant to peeling, flaking, rotting or corroding. These doors are made of a glass-based material, which can look like wood. 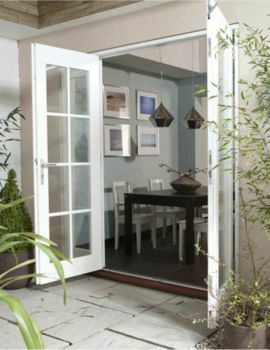 Fiberglass patio doors are energy efficient and require virtually no maintenance. They are sturdy and can stand up to harsh weather and do not warping, rot or deteriorate.